Jonny Williams ruined McMinnville’s homecoming last season, catching a game-winning touchdown pass with only 1:25 remaining. 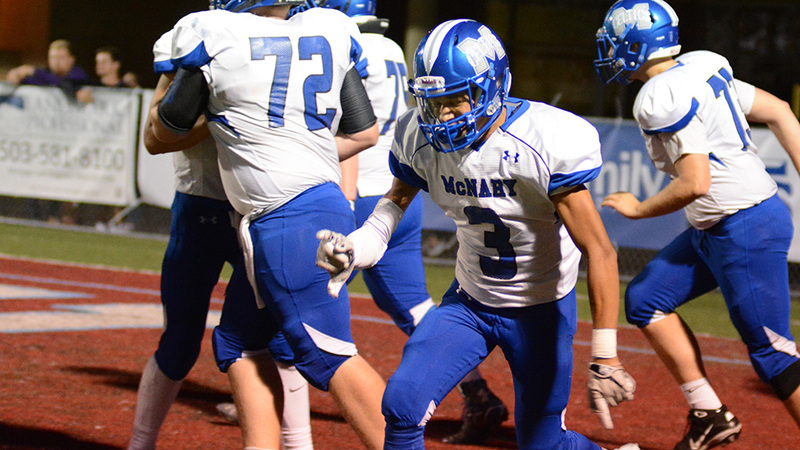 This Friday, the McNary senior wants to make sure the Grizzlies don’t return the favor. Last season’s contest was a coming out party for Williams, who entered the game with only two catches, but had receptions of 41 and 30 yards in the final three minutes, including the game-winner when he out-jumped a McMinnville defender in the end zone on fourth-and-25. Dealing with a quad injury, this season, Williams missed the McKay game and played sparingly at Forest Grove but he expects to be a full go against McMinnville, which will be a welcomed sight to a McNary offense that has been inconsistent in the past three weeks, largely due to turnovers and penalties. But Williams saw other issues on the Forest Grove film as well. “A lot of times we ended up throwing check down routes when we could have hit a deep ball and a few bad routes, so we’re working on fixing that,” Williams said. The Celtics will face a McMinnville defense that has allowed an average of 38 points over the past three games, the latest a 39-37 loss to South Salem on Friday, Sept. 29. Watching the Grizzlies play McKay, a game they won 35-14 on Sept. 8, Williams believes McNary has the skill players to exploit McMinnville’s defense. “Watching that film, I think we can definitely take advantage of some opportunities in the secondary,” Williams said. The Celtics defense is playing at its best, having allowed just one touchdown to both McKay and Forest Grove the past two weeks. McNary head coach and defensive coordinator Jeff Auvinen said the key has been getting all 11 players on the same page. “Kids are flying around and starting to trust their neighbors and starting to disguise what they’re doing and I think it’s paid dividends,” Auvinen said. The Celtics also hope to get senior Tim Kiser back, after the defensive lineman suffered a concussion on Sept. 15 against Sprague. McMinnville graduated quarterback Wyatt Smith and running back Cedric Agcaoili-Ostrom, who rushed for 200 yards and two touchdowns in last year’s game. “They do a lot of different things on offense so I think it’s going to be quite a bit to contend with there,” Auvinen said.